Youth volunteer Korbi Thalhammer, right, being an outstanding advocate for the trail with a Congressional staff member during PCTA’s annual Hike the Hill event. As the primary protectors of the Pacific Crest Trail, we are advocates on the trail’s behalf. We seek its full protection, preservation and funding with members of Congress and state and federal agency officials. To that effort, passionate staff and volunteers attend hundreds of meetings and respond to countless proposals that may have long-term effects on the PCT experience. We contribute our expertise to the decision-making process and ensure that our collective voice is heard by land managers and officials from west to east. Part of our advocacy work involves securing full and appropriate levels of financial support for our partners and our programs. 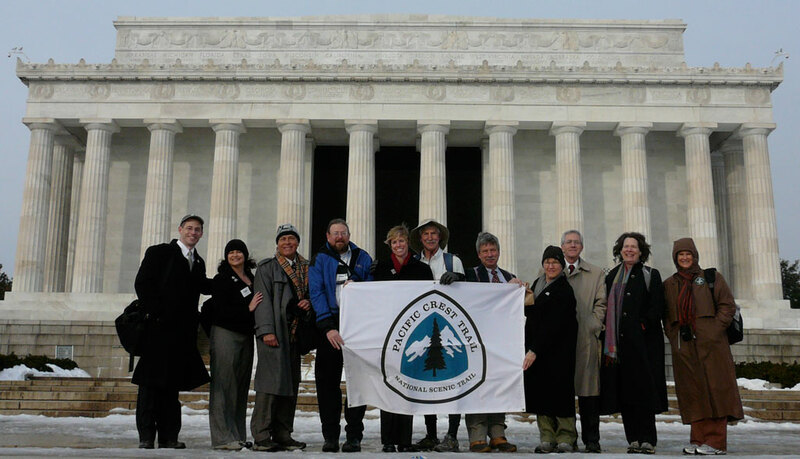 We play an active part in the movement advocating for trails and wilderness protection nationwide. Advocacy is largely about relationships. Often the process is slow – this work can take years. Our steady and capable presence is remembered and recognized by managers and decision makers nationwide. Federal Fiscal Year 2019 Appropriations Request: We present our Hike the Hill packet to members of Congress and ask them to fully fund the Pacific Crest Trail. PCTA at Hike the Hill. A component of these efforts includes an annual trip to Washington D.C. in collaboration with the American Hiking Society and the Partnership for the National Trails System known as “Hike the Hill.” Each year our delegation of PCTA volunteers and staff advocate for trail funding and other legislative priorities. We share our successes and challenges with leaders who will make decisions about federal funding for trails. A significant part of the effort includes preparing and presenting information for Congressional offices. Thanks to the efforts of dedicated volunteers, staff and partners, our Hike the Hill presentations keep Washington D.C. up-to-date about the issues facing the Pacific Crest Trail and public lands. Volunteers travel to D.C. for the trail. Annually, we urge Congressional support of appropriations for the Forest Service, Bureau of Land Management and the National Park Service for PCT maintenance. Programs administered within this budget are programs that give back – to youth, to rural communities, and to the public. The youth corps and volunteers learn trail maintenance, construction and reconstruction, and gain experience in cooperation and leadership. Jobs are created in rural areas, while visitors from all over the world spend their recreation and tourism dollars in communities along the trail. At the same time, the ongoing work of keeping the trail accessible is achieved. These programs represent what can be accomplished when people work across boundaries toward a common goal. 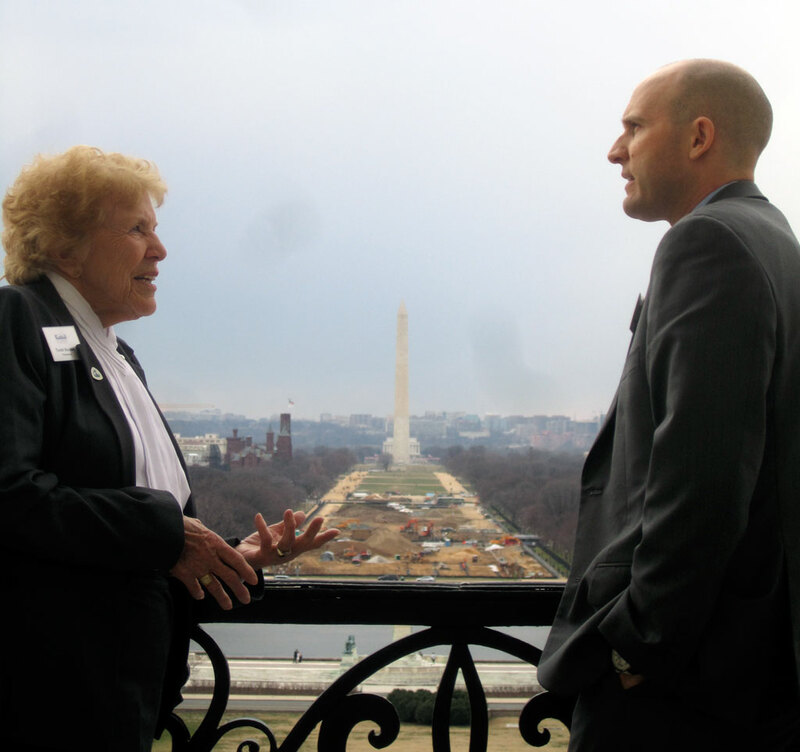 Our advocacy work extends beyond the halls of Congress. Throughout the year, we are building relationships with officials at the local and state levels. We seek champions to celebrate and spearhead our cause. From townships to districts, the trail touches the lives of thousands of people. A large part of our advocacy work ensures that the needs of this National Scenic Trail are considered as decisions are being made, both on bills that come before lawmakers and projects proposed to land managers such as timber harvests and energy development. These processes usually are complex and lengthy. They take diligence on our part to see them through. We contribute to city, park and state plans. Our staff advocates on the trail’s behalf to ensure that this wonderful experience is protected. Over the last 17 years, almost $36 million from the Land and Water Conservation Fund (LWCF) has been used to acquire and permanently protect about 23,000 acres along the PCT. But LWCF is threatened. The important program will expire on Sept. 30, 2018 unless Congress votes to renew it. We believe reauthorization and full funding of the LWCF is essential, and we are not along. Many groups representing conservation, recreation and outdoor interests are also part of the push to get Congress to renew this important program. Please read more about the Land and Water Conservation Fund and take action to keep it alive. Interested in learning more about our activities? We regularly publish advocacy updates in our member magazine, the PCT Communicator, and on our blog. Join us in advocating for the trail.